New players will get the chance to learn to play the game, and purchase a limited amount of Archon unique decks available to our customers. We invite you to drop by and check out this highly anticipated game, designed by Richard Garfield, the designer of Magic: the Gathering. 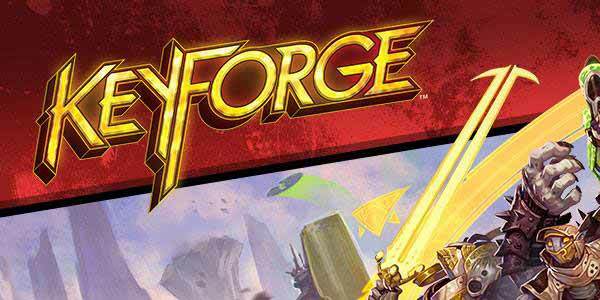 Come take a close look at the world of Keyforge, a place of ceaseless wonders and discovery. Keyforge is the world’s first “Unique Deck” Game. Well, it’s crazy, unexpected, fast… and FUN! None of the cards come with resource costs, so everything is free to play! But you can only activate the cards from one of your deck’s three Houses in any given turn. As a result, you have to learn how to use the cards in your hand and your deck as effectively as possible as you race your opponent to gather Æmber, forge three keys, and claim the secrets hidden within one of the Crucible’s many Vaults. You’ll have your chance to sample all the game’s wild and explosive back-and-forth action. Giant creatures! Tiny creatures! Cute creatures! Advanced technology! And wormholes that deposit you in lush jungles! In the Crucible, anything’s possible… and it usually happens. Join the rush of players looking to collect their KeyForge decks at the Pre-Launch, and you can even claim some cool swag! After you learn to play the game in the store, you can collect a special KeyForge lanyard and glossary card (while supplies last). Then, after you purchase your Archon Deck, you can claim a pin for your favorite House (again, while supplies last). The Crucible, the world of KeyForge, is a place of many quirks, constant change, and ever-evolving delights. Come discover this world, this game, its many Houses, and their species, cultures, and technology. Come play. Have fun. Get a jump on this new game! hon poster.